LO: Yes, I totally remember the book. It was the Italian version of “Anything you can do” by Darrel T. Langart (a.k.a. Randall Garrett). It was the seventies, I was thirteen and it was the first science fiction book I read. I bought it just for the cover. 3DAD: Looking at your past experiences and your resume, recreating the type of artwork you are a fan of is and has been important to you. 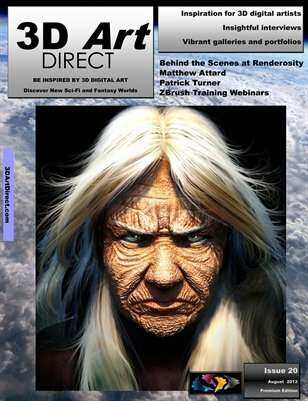 You tried airbrushing and plastic model making before focussing on digital art with Bryce. Did you start with Bryce early on it’s history? 3DAD: What were some of the first learning curve challenges you found with Bryce. Did you find a natural affinity with working with it? LO: I had previously used Photoshop filters “KPT, Kai’s Power Tools” on a Mac, and I found the PC Bryce interface very similar and familiar. 3DAD: I notice that your original degree was in surveying, yet your career now is very much to do with the arts and publishing. How did you end up changing track – did this change occur quite early on in your life? LO: Very Early. At the age of twenty, I started with some friends a special effects company for film and television in which I worked for ten years. It was the eighties and the personal computers were still awful machines for accounting! At the time special effects were achieved with scale models, explosions, special makeup and some tricks on film printing. Personally in my company, I was responsible of the construction of scale models. I do the same now in 3D! 3DAD: From 2000-2005, you worked at Qubica. What are a few key things you that you learnt whilst working amongst other professional digital artists. Did it for instance improve your workflow methods? LO: My experience at Qubica (now Qubica AMF) had improved my workflow methods. All work at Qubica was made with a high professional level at warp speed. I’m still at warp speed! 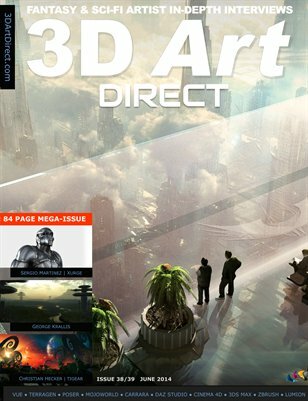 3DAD: After Qubica you started your own business doing fantasy and sci-fi illustrations. Was it preferable working for yourself and working on your favourite genres? LO: A lot! It was what I always wanted to do and I did it. Furthermore, despite the fact that there are many Fantasy and Sci-Fi artists out there, there are relatively few who work professionally in the world. So I carved out a niche in the market, even if technically I’m not the best. Unfortunately today’s genre market is really a niche, much more than in the past. If I had started ten years before with genre illustrations made in 3D with PC, my career would be such as Fred Gambino (see http://www.fredgambino.co.uk) who was the first pro illustrator to use 3D, and in particular Bryce for his works, but he was older, wiser and more English and Anglo-Saxon than me … I still live at the extreme outskirts of the Empire! 3DAD: Did you have some early breakthroughs with gaining some commissions and clients in the early days of your company? LO: I have breakthroughs in every project. Every time I discover a new way to achieve my goals with less time being consumed. The important thing for the customer is the result, not the method which it is reached, and for the customer, the less time a project takes, the better. 3DAD: You’ve mentioned that when using Photoshop, you’ll often use it to remove details and make things less “cold” in your illustrations. 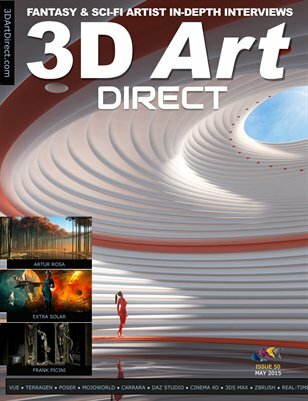 Is this to overcome the fact that 3D digital art can appear to perfect, with edges and shapes looking too “on the nose”? LO: I think that the most important thing is, at the end, that the result is a true illustration and not a life-like render. 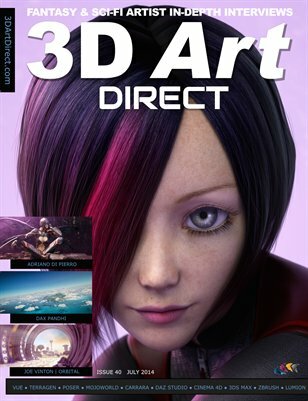 Realist renders are okay for movies, commercials and also for games, not for illustrations in the publishing industry. 3DAD: You’ve mentioned that you use Groboto – what are some of the works you’ve created with this that you are most proud of? LO: Groboto is great for weird backgrounds or to make strange 3D meshes. Besides achieving excellent renders, Groboto gives you the ability to export the meshes that it generates in useful 3D formats. 3DAD: You’ve also mentioned that Bryce give you more creative freedom and a faster workflow. What features of it allowed this to happen? LO: Mainly the interface, for me it is particularly natural. You can totally love or hate Bryce’s interface. Artists from “serious” programs such as Maya usually hate it because they find it unintelligible or “too easy” or “unprofessional”. 3DAD: In your opinion how could Bryce be improved? LO: In a couple of things: some simple modelling tools such as a lathe tool and an extrude tool. The most important improvement would be a serious mesh export tool. After all these years (more than 10) Bryce still does not have real way to export in other 3D formats the mesh created with the program, and I’ve seen meshes created with Bryce by various artists that are really amazing. 3DAD: I’m glad to see you are a fan of Chris Foss and Peter Elson. I’m a big fan of Peter’s work as well and I am sure you are aware of the website at peterelson.co.uk showing most of his works, organised by his sister. She asked me a few years ago on recommending how to provide poster prints for the fans. I am a big fan of Harry Harrison’s sci-fi books and short stories and many of his books were illustrated by Elson in the eighties and nineties – so that’s how I was introduced to Peter’s work. What are a few favourites images of your of Peter and Chris’s work? LO: I know via email Peter’s sister too; she contacted me because for many years I created a web space “The Unofficial Peter Elson Homepage” (http://www.innovari.it/peter elson 1.htm). The site is my tribute to this great artist who died prematurely. Of Peter’s works I like best are the ones with spaceships as a subject. I believe that Peter, with his works, have changed forever the way of imagining and designing a spaceship – much more than Chris Foss did. His designs still influence today all the genre artists. If he were alive today, he certainly would have worked successfully in the gaming and entertainment industries. 3DAD: You’ve worked in the film industry for 10 years – specialising in sci-fi and special effects. Do you feel that directors are gaining better artistic control over special effects recently. I think in the early days of effects, the effects houses tended to drive the style of the output a bit more – simply because the technicalities of it were over the directors heads. LO: I don’t believe so, it is exactly the opposite. Todays movie directors have totally lost control of the scripts, due to the fact that the special effects, in todays standards are always perfect, and are too easy to make. In the past the story was more important than the effects. You can still watch the 1951 movie “The Thing from Another World” because of the dialogues – a movie where the alien, the main character, is virtually never seen. In six months from now who want to see a movie like “Battle: Los Angeles”? “Dreamy Planet” is a good example. movies such as “Forbidden Planet” or “Blade Runner”. It is easy today to make a movie full of amazing special effects. It is not easy to do a good movie! For these reasons, the genre TV Serials are always better than movies: less money for special effects, more imagination in the development of the stories and the characters. Many times a pilot episode is better than a movie. 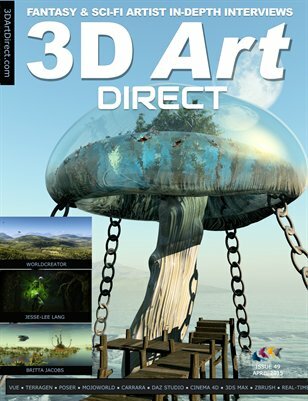 3DAD: You’ve also work in publishing with your publishing house “Edizioni Scudo”, promoting the works of writers and illustrators – I think mainly for the Italian market, which is very much the same goal as 3D Art Direct. 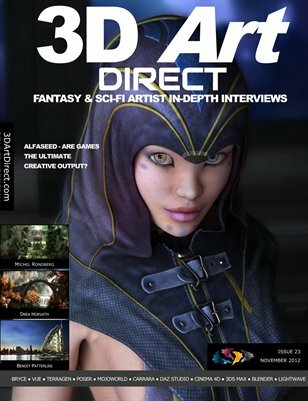 Is there a lot of talent in Italy with regards to sci-fi writing and illustrating? LO: The Italian publishing market is very xenophilous. Today publishers prefer to produce genre novels bought from the USA. Because of this bad habit (imposed to the readers by decades by the publishers) the readers still do not trust the Italian genre authors, but something is changing and we try to ride this wave. 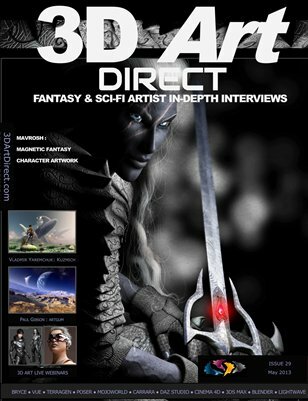 We are a very small publishing company but well known in the Italian fantasy and sci-fi scenes, and we are gaining space in the hearts of the readers with our project. We believe that with the advent of Ebooks and the print-on demand books, it will certainly give room for the creativity of the writers of our country and space for publishers like us. 3DAD: Tell me about your book “Innovari” that you’ve published. Is this a collection of your best work? Was this book a long time in the making? 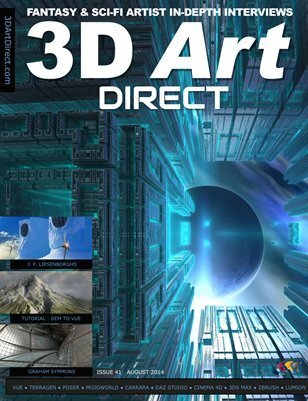 LO: Actually my printed book “Innovari, the fantastic digital art of Luca Oleastri” is a collection of works made before 2006. All these books together, contain my best works over the past decade. 3DAD: Is there any other recent work you have done that would like to mention and promote at this time? LO: Yes, I’ve just finished work on a series of colour illustrations for a Steampunk anthology book published by my publishing house, in which all the stories are set in Italy. I’ve posted some of the artworks on Renderosity. My preferred one of this series is named “STEAMPUNK – The Steam Fairy” . With this image, made in Poser (software that I use frequently) and Photoshop, I think that I have completely hit the Steampunk theme. In the last few weeks I’m working for a U.S. company on a Sci-Fi tabletop game full of spaceships, but this is top secret! 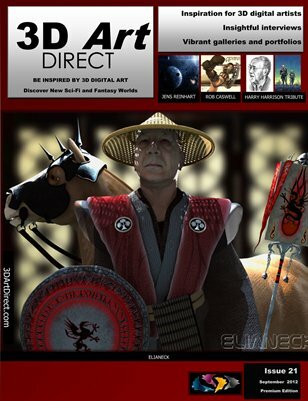 3DAD: What three tips would you give those who are just starting out with digital art? * Always experiment, try to find new and fast ways to do the usual things. In this holistic process you will find also a way to do brand new stuff. * Try to focus on your favourite subjects. For example, If you’re good in fantasy subjects, do not waste your time trying to make children subjects. The mood won’t work, and specialization certainly has it’s rewards. * If you are working for a customer keep the deadlines. This is the basic rule to be a professional, and this is what customers want.